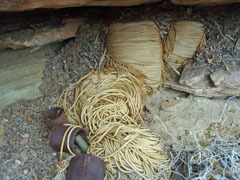 Coils of rope left behind. 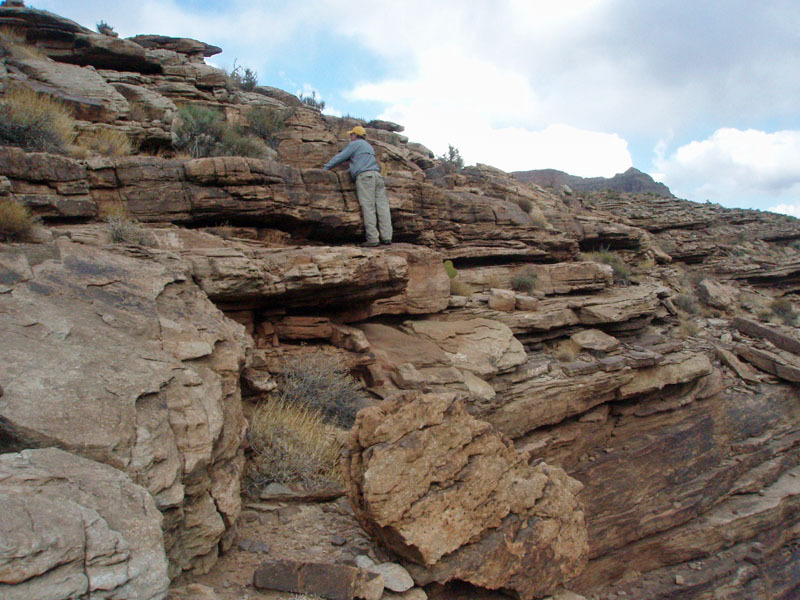 I posted this up on my regular blog site intending to add to it for the Hiking Grand Canyon section. Well, over two and half years later I haven't done that yet! So, this is the version I used and any additions will appear at the bottom. Over the Thanksgiving break of 2009, I was able to backpack into Trinity canyon, so that I could "finish" up my spring break hike that was cut short by an accident. 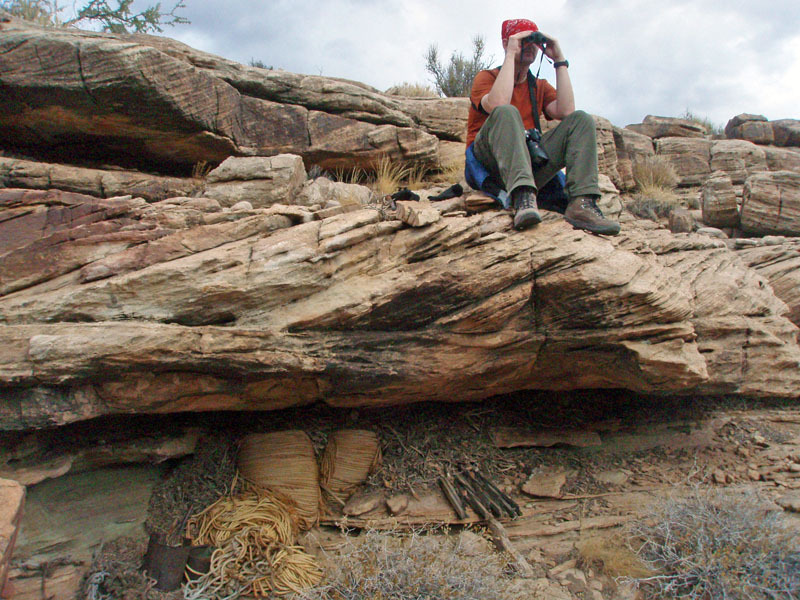 I was also interested in being able to spend some time looking for traces of an old survey crew. Bill Ferris and I found the sites I was interested in and we got some great photos. Bill wrote up a great trip report on his blog, and I solicited the local paper for an opportunity to write about our little adventure. The editor was quite interested and my story ran on January 19, 2010. The story appears below, although I have added in a number of photos that were not in the paper. 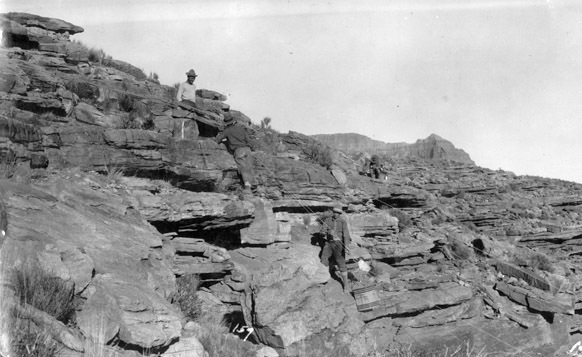 In 1916, George K. Davol convinced the Santa Fe Railroad that it would be worthwhile investing in a project that would enhance the allure of the Grand Canyon and entice more tourists to visit that awesome natural wonder. The project was an aerial tramway that would stretch between the two rims of the mighty canyon. 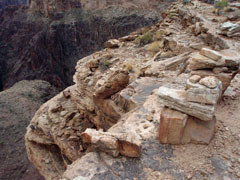 Passengers would “sail” over a breathtaking landscape as they plied their way down from Hopi Point to Dana Butte to the Tonto plateau and then up to the Tower of Set, and further up to Horus Temple and Osiris Temple, then crossing over Shiva Temple before touching down on the North Rim. Click on any of the photos, below, to see a larger image. 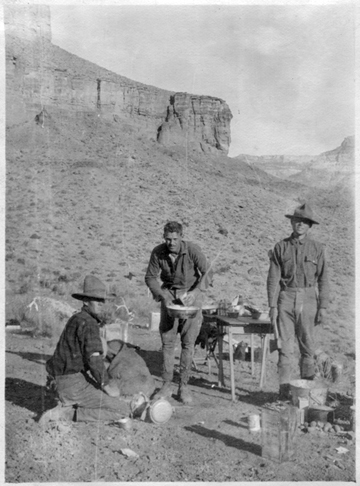 1919 survey crew poses at North Tonto camp. We found the campsite - a terrace in Trinity canyon. Today, we can only half close our eyes and imagine such a spectacular voyage. In the fall of 1919, barely six months after the Congress designated the Grand Canyon as a National Park, Davol, with the blessing of the Park Service, began his survey. It would involve at least a dozen men, last more than three months and chart out a route to the Tower of Set before the vagaries of winter closed down their efforts. 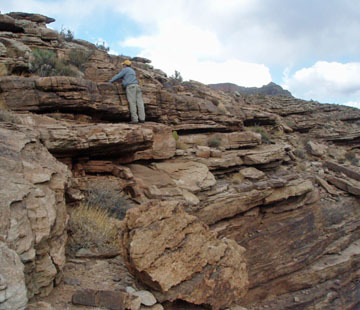 In the spring of 1920, the Park Service nixed the project, and the survey was never completed. Fast forward to November of 2009. 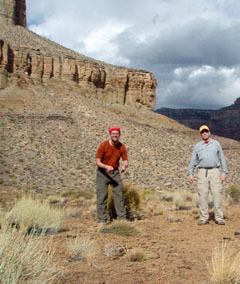 Bill Ferris and I have plans to hike into Trinity Canyon, west of the popular Phantom Ranch. We have six days to reach the spot on the Tonto plateau, below the Tower of Set, where I had to be airlifted out of the canyon this past spring, when I suffered a debilitating injury to my foot. That accident prevented me from completing a nine day hike from Crazy Jug Point to the South Rim, and I was quite keen to “finish” this trek in the manner I had intended. Some of the 1919 crew pose at the site of their 1919 "North Tonto" camp. Bill and I tried to recreate the pose, but we seem to have suffered from some kind of mirror-image bias! 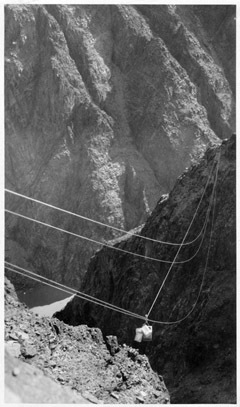 To the right is the supply tram link that brought supplies up to the north Tonto, near the campsite on a higher terrace. With six days, we had time to do some exploring. So, I brought along some old photos of this 1919 survey. 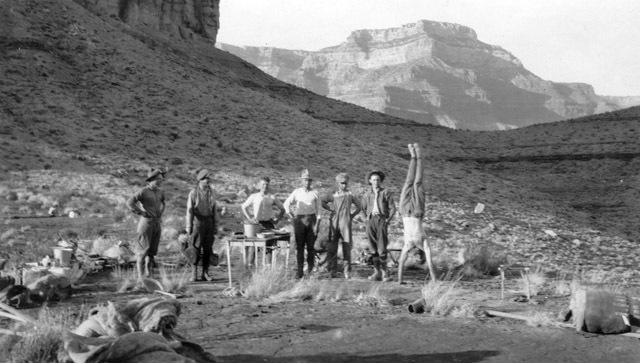 They rigged up short “supply trams” across the canyon to facilitate their work, and I suspected that we would be able to find the remains of one such tram terminus, on the Tonto plateau, as well as their nearby campsite. Ninety years after the survey crew departed, we found their campsite on a flat terrace by matching up this location with the old pictures. 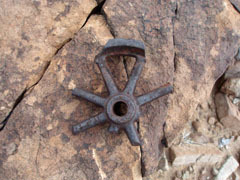 Lucky for us, as the site looks to have been scrubbed clean – all we found in the area was a washer, a nail and a small bolt. It appears that they did a good job of cleaning up after themselves. The survey crew mans the top of the supply tram link on the Tonto, north of the Colorado River. of the spot where the third crewmember was standing - there was a drop of over a hundred feet! We turned our attention to the tram site and wandered along the rim of the Tonto plateau, overlooking the Colorado River. 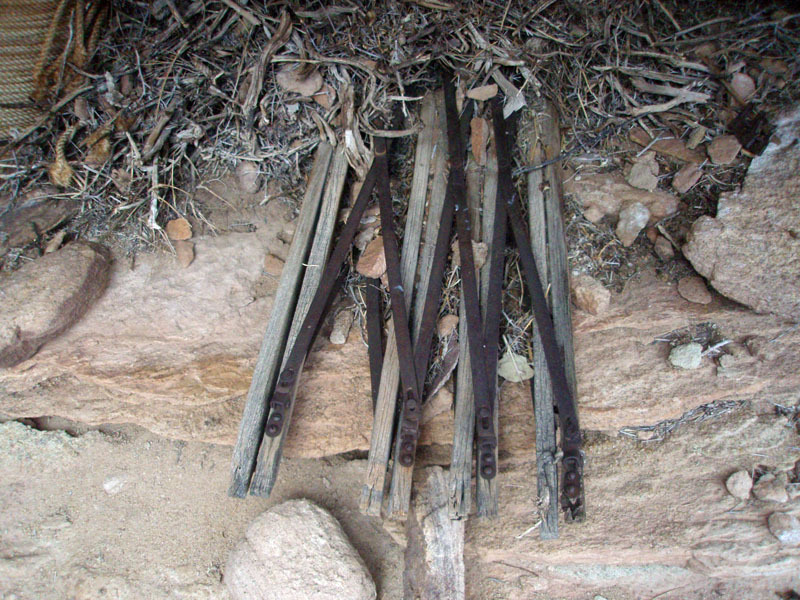 Aided by the old pictures, we soon stumbled across supplies left behind and tucked away under a ledge – coils of rope, small buckets of screws, bolts and nails, some kind of gate, and odd pieces of the machinery used to make the tram work. 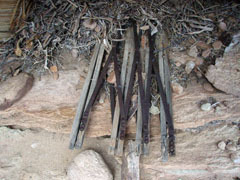 There may be more in this cache, but the mice have had many decades to pile up sticks and twigs in the gaps. Given its rather obscure location, I would not be surprised if we were the first ones to gaze upon this site since the survey crew stuffed these supplies under this ledge, no doubt expecting to return the following spring to continue with their work. These blocks mark tram terminus. Bill perched above cache overhang. 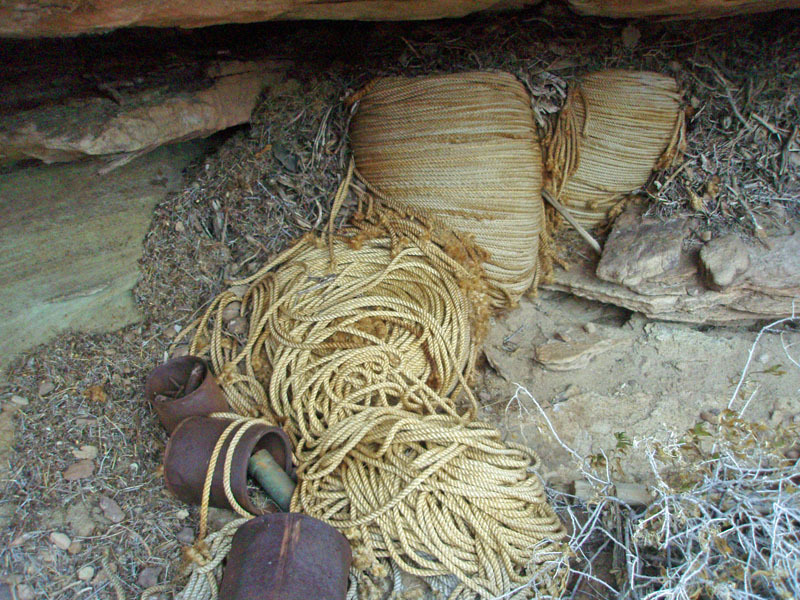 Coils of rope and buckets. We had rain the last night we were in Trinity. And, we could see snow on the rims in the morning. Not entirely unlike the Davol survey crew’s experience. We packed up and made our way back to the campground near Phantom Ranch, leaving behind the dreams of a different era. 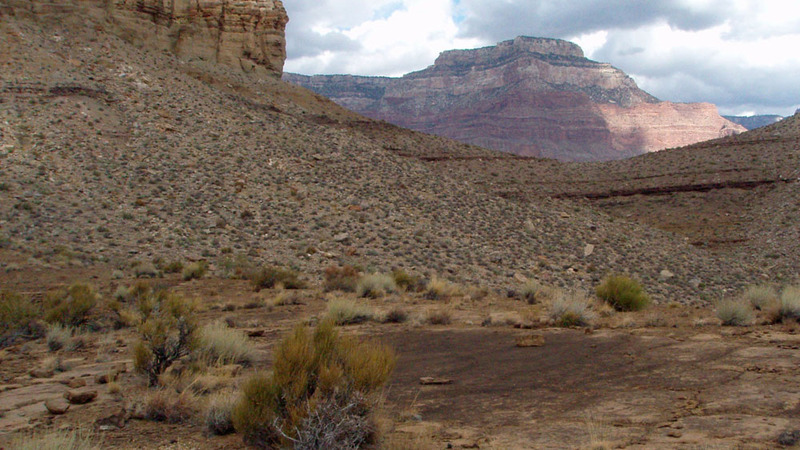 Dennis Foster has been hiking in the Grand Canyon since 1977 and has spent over 300 nights camped in the canyon’s backcountry. 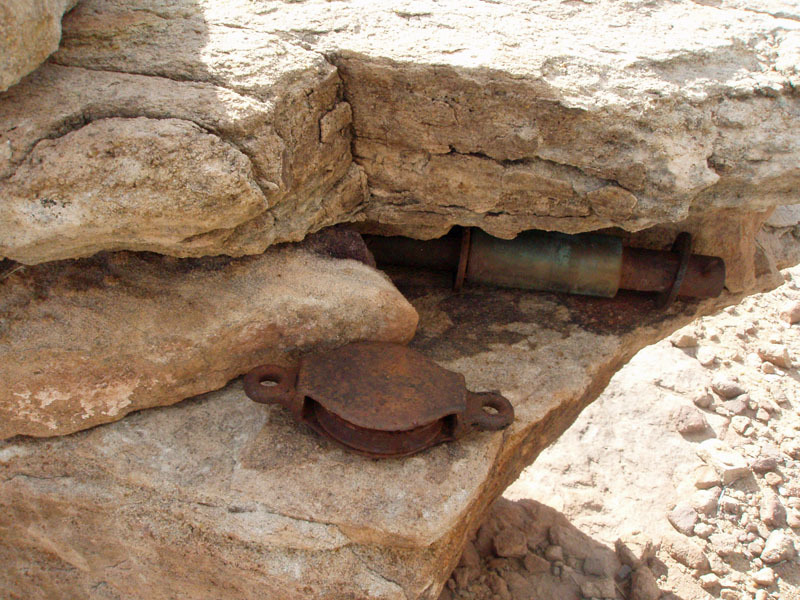 To learn more about this survey: Read Jim Ohlman’s “The 1919 Transcanyon Aerial Tramway Survey,” in A Gathering of Grand Canyon Historians, edited by Michael F. Anderson, and available from the Grand Canyon Association. 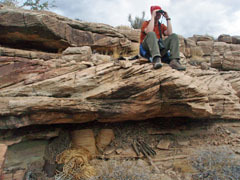 Photos from the survey: Visit the Special Collections and Archives Department of Cline Library at Northern Arizona University. The Robert Ryan Collection (he was a member of the survey crew) is available on-line. Grand Canyon: To learn more about visiting the Grand Canyon go to www.nps.gov/grca. Follow the link to “Backcountry Hiking” to learn about the permit system for inner canyon camping. 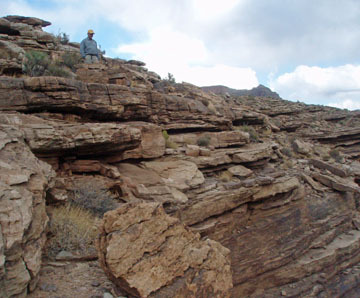 OR www.grandcanyonscout.com . The paper only used the old photo of the group at the campsite, and the photo of Bill and I posing, but none of the materials left under the overhang. 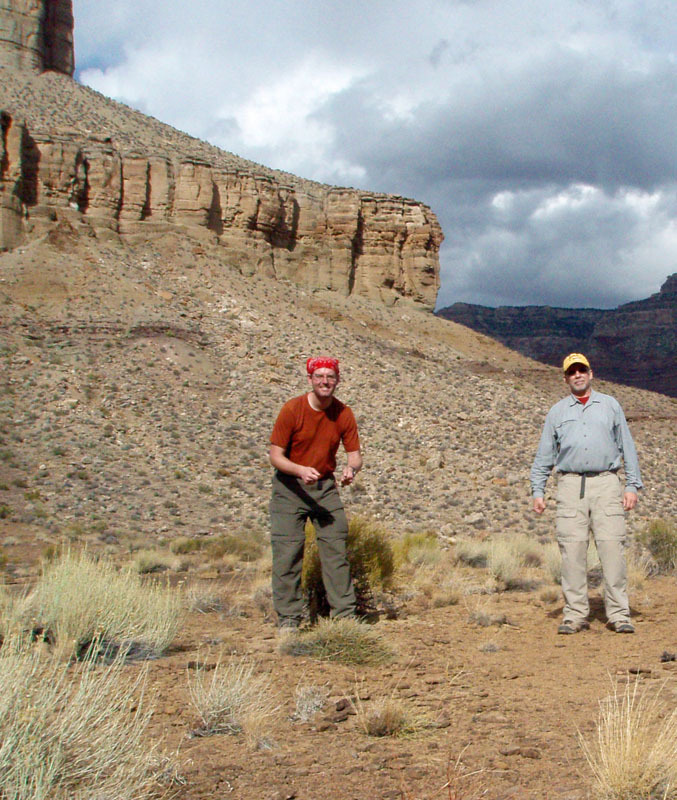 Bill and I are now keen to search for the terminus on the south Tonto. 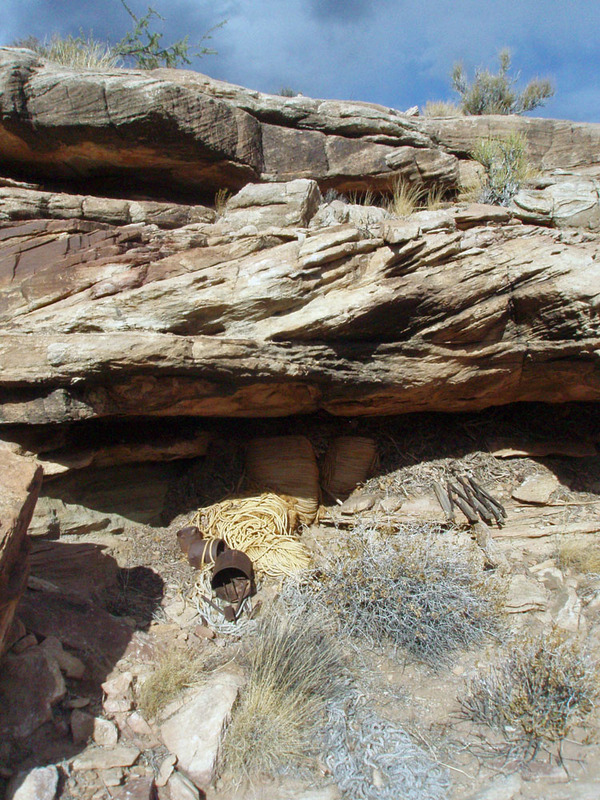 And, I am still interested in finding the final campsite, located atop the Redwall, north of the campsite we found. 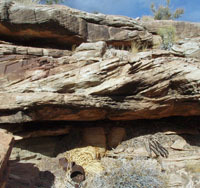 That was, in fact, the main object of my interest, but the route up through the Redwall looked more than a little rough, so we decided to look for the remains of the Tonto operation. Also of interest, to me at any rate, is that the editor choose to use my working title as the title for the newspaper article. A first, I think! Invariably, he changes my titles, to make them more interesting. A piston and pulley. Hmm... likely part of a pulley set-up. A gate? Jim Ohlman says a cot.